This page contains a summary of previous research work and will be a repository for unpublished (in peer-review journals) data and analyses resulting from my work as a research scientist. With the collaboration of students and colleagues, a number of useful contributions have been made to crop protection and production. We were the first to demonstrate the efficacy under field conditions of the fungus Epicoccum nigrum for biocontrol of white mould of bean and that fungicide-tolerant strains of E. nigrum could be produced and used effectively. Larvae of the insect Bradysia coprophila were found to be efficient consumers of sclerotia of the plant pathogenic fungus Sclerotinia sclerotiorum; enzymes in the salivary gland secretions of the larvae reduced the ability of the sclerotia to germinate and feeding activity of the larvae was shown to be affected by soil chemistry and type. Collaborative studies also lead to the identification of a new bioherbicide for management of the weed Convolvulus arvensis. Research conducted on diseases of medicinal herbs resulted in new findings concerning the etiology and ecology of root and foliar diseases of ginseng, goldenseal, evening primrose, stevia, and other plants. Most peer-reviewed publications are available in pdf format at ResearchGate. 1) Rhexocercosporidium panacis. This fungus is a pathogen of ginseng (Panax quinquefolius). My lab discovered and named this fungus and we were the first to demonstrate its role as a pathogen of ginseng and cause of the disease ‘rusted root’. 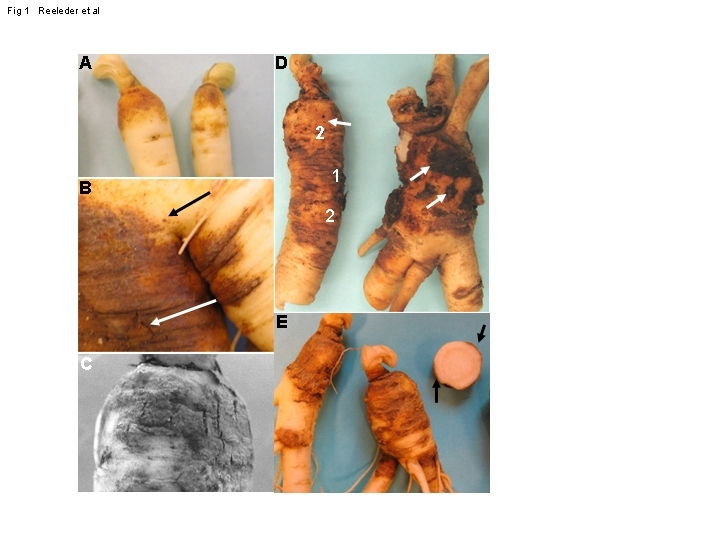 This disease (also known as ‘the rust’ or ‘rusty root’) was first described by Hildebrand in Ontario in the 1930s and was widespread throughout ginseng-growing regions in North America at that time. Symptoms and some historical notes can be found in the first citation below. Several different fungi have been identified as possible causes of this disease, but none of them (until the discovery of R. panacis) were able to adequately reproduce the symptoms. See here for some background information on this disease. Rusted root disease is characterized by slightly raised reddish brown to black root lesions of varying size. Small blister-like lesions expand and coalesce to form large lesions that possess a diffuse margin. The peridermal tissue often becomes very dark red, almost black, in color as the disease progresses. The lesions, regardless of size, remain superficial; however, peridermal tissue is ruptured and sloughed off, giving the root a pitted or scabbed appearance. Fragments of the blackened and ruptured periderm may remain attached to the root at harvest. When roots have been dried, lesions often appear light brown in color. Except where symptoms are severe, the disease appears to have little effect on yield; however, the discolored, scabby, and often deformed appearance of diseased roots reduces their value. The term “rusty root” also is applied to this disease; however, Hildebrand’s use of “rusted root” has historical precedence and may be preferable, in part due to the use of “rusty root” to refer to other unrelated problems that occasionally are observed on roots. Note: Click on the above image to view more clearly in a separate page. After pathogenicity assays with various fungal genera isolated from diseased roots using agar-based culture media (yielding mainly Fusarium and Cyndrocarpon isolates) failed to reproduce observed disease symptoms, my lab began using DNA extraction techniques in 2004 and 2005. Our first set of extractions from diseased-tissue samples (amplified using universal fungal primers) yielded a wide variety of species when submitted to GenBlast but, consistently, we found DNA identified as belonging to a Rhexocercosporidium species. Healthy ginseng root tissue did not contain this DNA sequence. Comparison of this DNA to DNA extracted from isolates of Rhexocercosporidium carotae (the only other known species in this genus) suggested that the Rhexocercosporidium from ginseng was a previously undescribed species. When we used some alternative agar media (which suppressed competing Fusarium and Cynlindrocarpon species adequately), we were able to isolate this fungus consistently from diseased ginseng root tissue. Using ginseng roots (grown in greenhouses to avoid field-related latent infections), we were able to reproduce symptoms of the disease. The isolates of Rhexocercosporidium from ginseng were sufficiently different from R. carotoae that we have described a new species, R. panacis, to accommodate these isolates. Reeleder, RD. 2007. Rhexocercosporidium panacis sp. nov., a new anamorphic species causing rusted root of ginseng (Panax quinquefolius). Mycologia 99(1): 91-98. Poster for CPS-SWO Regional Meeting 2007 Rhexocercsoporidium in ginseng gardens This poster describes some subsequent work (up to early 2007) that shows that stratified seed is the most likely method of introduction of R. panacis into ginseng plantations. Improvements in seed handling might therefore reduce incidence of rusted root in ginseng fields. Evaluate use of carbendazim, thiophanate-methyl, and fenhexamid as possible seed treatments, pre or post-stratification. Avoid use of soil/sand contaminated with R. panacis for seed stratification. Consider above-ground controlled stratification procedures. The fact that some lots of stratified seed are free of R. panacis suggests that some growers are successful in reducing the incidence of contamination/infection. Use detection methods such as qPCR to avoid planting into R. panacis – infested soil. Cylindrocarpon destructans f.sp. panacis (Ilyonectria radicicola) causes disappearing root rot of ginseng and is likely responsible for a replant decline that limits repeated use of land for ginseng production (Kernaghan, Reeleder, and Hoke 2007)(Reeleder, Roy, and Capell 2002)(Jang et al 2010). Both disappearing root rot and ginseng replant failure, or replant decline, are common issues in ginseng production. As long ago as 1935, Hildebrand showed that Cylindrocarpon destructans (then known as Ramularia) caused root rots of ginseng in Ontario (Canada) so severe that nothing was left of the root but parts of the periderm – the root had ‘disappeared’. Further, growers discovered that, once land had been cropped once to ginseng (the typical ginseng production cycle is 3-4 years), it often could not be used successfully to grow ginseng a second time. Attempts to do so often resulted in crop failure, with many plants dying within two years. This occurred despite treatment of soil prior to planting with the chemical fumigants that have become available in more recent decades. The cause has long been unknown but has been attributed to soil nutrition, soil toxins, etc. In a series of microplot field and greenhouse experiments, we showed that, although fumigation failed to resolve the problem, steam treatment (pasteurization) largely eliminated symptoms. The only pathogen which was 1) able, in pathogenicity trials, to consistently reproduce the symptoms of decline (severe root rot followed by plant death), and 2) isolated consistently from symptomatic roots was C. destructans . The evidence thus suggests that C. destructans is the cause of replant decline and that decline is really an outbreak of disappearing root rot; an outbreak that is simply occurring earlier in the production cycle than is usually the case. Knowing the cause, while important, does not provide a solution to the problem – the inability to use land for successive crops of ginseng. Although in-vitro and soil drench tests identify some possible candidate fungicides, they may not be sufficiently effective or economic to use under field conditions. Short of a feasible control or management strategy, one approach that might be useful would be the identification of fields or sections of fields where the pathogen is absent. Those locations could then be planted to ginseng with less risk of crop failure. Using real-time polymerase chain reaction (qPCR) methods, we have been able to detect C. destuctans in field soils many years after production of ginseng and demonstrate experimentally that the PCR signal correlates with disease severity. With this method, the potential of a field site to be used for ginseng could be rapidly evaluated.